NASA astronauts Scott Kelly and Kjell Lindgren ended their spacewalk at 2:10 p.m. EST with the repressurization of the U.S. Quest airlock. The astronauts restored the port truss (P6) ammonia cooling system to its original configuration, the main task for today’s spacewalk. They also returned ammonia to the desired levels in both the prime and back-up systems. In a minor departure from the planned tasks, the astronauts ran out of time to cinch and cover a spare radiator known as the Trailing Thermal Control Radiator. 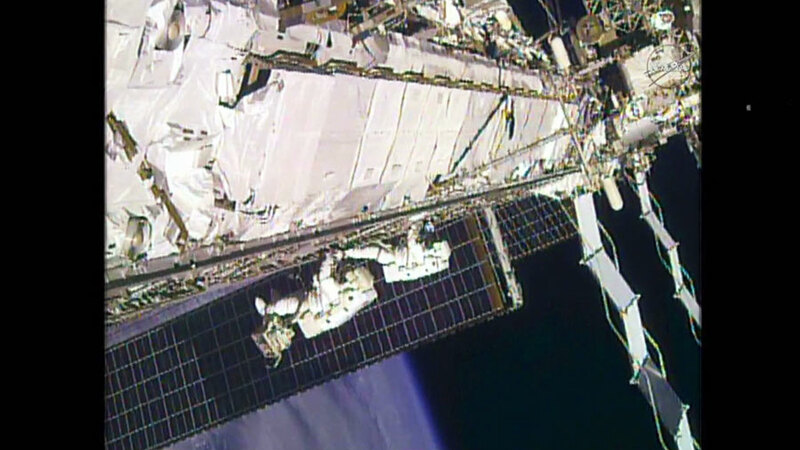 The radiator, which Lindgren retracted earlier in the spacewalk, was fully redeployed and locked into place in a dormant state. The radiator had been deployed during a November 2012 spacewalk by astronauts Sunita Williams and Aki Hoshide as they tried to isolate a leak in the truss’ cooling supply by re-plumbing the system to the backup radiator. The leak persisted and was subsequently traced to a different component that was replaced during a spacewalk in May 2013. The 7 hour and 48 minute spacewalk was the second for both astronauts, and the 190th in support of assembly and maintenance of the orbiting laboratory. Crew members have now spent a total of 1,192 hours and 4 minutes working outside the orbital laboratory. A 7 hour and 48 minute spacewalk – was it the longest of all? Or have there been longer ones? I saw this on Nasa tv. Pioneer sprit is treasure and pride for us mankind.i am so glad for this bright news! Very thanks.Please take a rest. I am glad ISS has really become INTERNATIONAL lately. Especially I think it is so important to launch Japan with their modern Japanese Technologies! Step by step it is important to improve conditions of long staying people at ISS with paying special attention to the safety and comforts. With this aim it is necessary to prepare a list of proposals on part of the Astronauts describing the desiring. I think it is the first question to settle. Next I will advise in the future message. I watched and listened as much as I could during today’s space walk, just as they were going to come from pressurization my iPad froze up. But it was very exciting to watch, I love to see the earth from way up there while they are outside the station. We often go out side and look up when they are going overhead in the evening. I hope you guys fully recover and are feeling well now. That was a very long, difficult spacewalk. Thank you for your service and take it easy guys! Well done you guys on your spacewalk. Get plenty of rest. Thank you for all your hard work, in the vacuum of space no less! And thank you for sharing it with us civilians. Rest up. You guys are brilliant, successfully accomplished this tough task!